Mark and Ming Ming’s wedding reception under the stars was an exquisite experience by the sea. The serene outdoor venue at Prive (Marina @ Keppel Bay) was transformed into a lush and delicate setting by the outdoor logistics team at ows.com.sg and the intricate planning and floral designs by spellbound weddings. Golden chevalier chairs were used to heighten the fairy tale-like atmosphere of the evening and to complement the elegance of the wedding concept that evening. Transparent tents combined with dainty faerie lights provided a unique outdoor wedding experience that left a deep impression on the guests and the couple alike. Note: With effect from 2010, the Management of Marina at Keppel Bay have announced regulations that wedding events are no longer permitted within the premise. 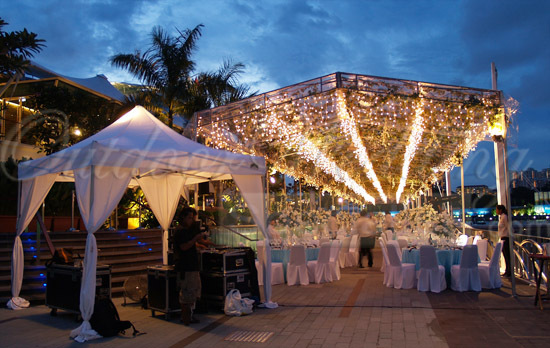 This post serves as a portfolio of OWS and visual references of outdoor wedding setup only. Hey Michelle, already emailed you. i didnt receive any mails from u. kindly check if u send to the correct email add. look forward to hearin from u. Can i have a look at this package and price plan. Thx in adv! can you provide me with details of this package. For venue decorating/designing and set up, is it handled by your team or the spellbound weddings? Would like a quotation as well. Thanks. Possible to provide me with details and pricing for this package for 2011? Like to find out the cost of this package. Like to know do u guys help with wedding planning as well and is the wedding deco done by your team? We can change the theme of the wedding deco right? Hi Eugene & Laura, already emailed you both! I’m looking to hold an outdoor/ beach wedding for a group of <100. could you give me a quotation for arranging such a set up? It will be helpful to include an indicative costs of decorations. Please provide details of package and price. I will like to find out more about the above package and price plan for it for approx 220 pax at the end of next year. Thanks a lot! Can you pls provide me with details and pricing for the above package for 2011? hi, can u pls provide me with the pricing for the above package for 2011. Info for rental of the place, min. 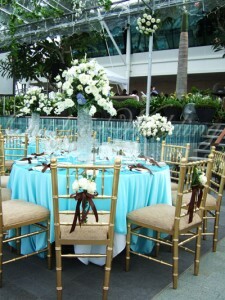 tables and max tables, decorating, catering etc. what is the approximate total cost for abt 40 tables to have a wedding like that? i would like to get more detailed information on this venue! looking to hear from u soon! Hello! Can you provide me with the price/package plan (Everything!) for Prive? Many thanks! Hello! thank you but I don’t seem to receive it, can you kindly resend it; I have provided an alternate email address. My apologies and thank you in advance! its the same email that was given previously. hi, can u mail me the package price and min/max table for the location as well… and any other details u feel relevant. thanks. Hi, the pictures of the wedding are stunning. I’d like to find out what such a package includes and all the costs involved. Hear from you soon! Thanks! May I have some information on the solemnization package at Prive; and the availability of 20th lunch/dinner and 11th lunch for about 50 pax. I wanted to know 11th dinner actually. Hi, can you send me more details please? Thanks! Could you kindly sent me the package/price plan as well. At your earliest convenience, many thanks! Can I have the price or package plan for Prive? As well as the min or max no. of tables for the location as well. hi would like to know package for about 250 ppl at the above location in 2012 oct.
I’d like to know what packages are available for the Prive, as well as the pricing, min & max pax and details etc. Hi, can i find out the breakdown cost for this venue @ Prive? May I know if the place is available for May 21st? Please let me know the package and price. Hi, can you email me your package for this for 2011? can you email me the quotations on this? minimum number of tables etc. Please advise on costs for a similar set-up for 80pax. Also, what’s the wet weather plan for this venue? Thanks! Hi, can you provide me with the cost of holding solemnization lunch/dinner at prive ? And what is the minimum pax required. can you email me the details on this? minimum number of tables etc. I would like to find out more about the max capacity to have a wedding like this. I love the transparent tent that is elevated to higher than normal height (so guests dont feel claustrophobic), but worry that there is not enough space to accommodate my capacity size. Please also let me know if the mezzanine level can accommodate the same type of seating. Will Prive be able to accommodate more people if it is in western style table seating? Also, where would the stage be erected? can you email me the quotations? minimum/maximum number of tables etc. can you email me the wedding package for 2012? Hi, this looks amazing!! !Can you please email me the details of the package? Thanks so much! Hi, can you advise me on the price, decorations, food catering and the minimum tables required? Is it by per pax? And what other the other charges included? Thank you. Please send me the dinner package for Nov/Dec 2012. for about 250-300pax. I am looking to have my wedding reception dinner in the outdoor venues of either keppel bay 1-twenty six or one rochester . I would like to enquire about the pricing. At the following date: 3rd December 2011.
hi, this place looks so beautiful and i am interested in holding my wedding there somewhere in june next year. can i pls have a quote or package for anout 250-300pax? thanks! Can you kindly provide me with details of this package. info on catering and min. tables. and quotation for 2012. Thanks. I like the deco very much. Are you able to reproduce the same at a different location? Kindly let me know of the package details for this too? I would like to host it sometime in Jan 2012. My Fiance and I will be getting married at the end of next year and will be holding a dinner for about 300-400 pax. Can i check if the above venue will be suitable, and if yes, how much would it cost? If it is nt possible, could I enquire if you have any other venues in mind? Hi there, would like to know what packages are available as well as the pricing, min pax and details etc. Hi would you mind sending me the price to do a outdoor solemnisation reception for about 150 ppl at keppel bay area with tentage? If I would like to have the same deco as shown in the above pictures how much will it cost? Appreciate if u can give me a breakdown. We will be looking at dec 2012, 100-150 pax. Hi can u please email me the price list and min/max no. of pax. Thanks! Hi, can i get the detail of this package, including the price, min-max pax and catering. I’ve yet to decide the date for my wedding, but I’m looking at either late 2012 or early 2013. Hi! Could u provide pricing for such outdoor tentage, fans n lighting for 200pax? Thanks! hi! I’m interested to hold my wedding in 2014. Appreciate if you could email me on the price plans and the seating capacity for each price plan plus solemnization. Also it would be great if you could let me know the cost of the decoration as found in the pictures of the post. It is very nice. can u please email me the price list and min/max no. of pax. Am looking at ROM for Sept – Dec 2012. Buffet Lunch or your food option availability. Is this able to accommodate est 500 guests? May I know the cost as well? I love the decoration shown above. Very beautiful and romantic. I would appreciate if you could email me on the details of such a setup. Any backup if it rains? Can such a setting be arrange in different venue? I’ve yet to decide the date for my wedding, but I’m looking at either late 2013 or early 2014. It’s really beautiful. May I know the details of this wedding package. 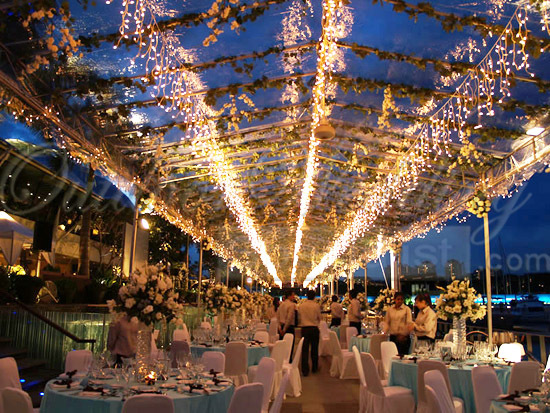 My wedding will be on dec 2013.
is this option available for 20 tables and what is the quote for it? I’ve contacted you via email on your post at the other article. I would like to enquire regarding solemnization package lunch/dinner at Prive (Marina @ Keppel Bay) on 31st July 2012. Pls revert regarding the details. I’d like to enquire if a similar setting at this venue is possible for 300pax sometime in oct 2013, n the quotation for it. Do let me know how I can contact u. Thank u! Can I enquire about the prices for a wedding solemnization package for 80-100 people? Please email me the quotation and details for rental and setup costs? Hi! We are looking to do a similar solemnisation for 30 pax and Chinese sit-down lunch/dinner for 160-180 pax in June 2013 (weekend). Can you please send us some quotations? Thank you!! Can I enquire about the prices for a wedding solemnization package for 120 people? email me your quotation. hi, can i have the full cost package for this setting at prive? does package include dinner/rental of space area or I have to find my own caterer and contact prive myself regarding rental space? Am planning for my wedding in Sept 2013. Could you send me details of this package (pricing of venue rental, tentage + lighting, decor, buffet dinner for 200 pax) please? Hi Eleanor, Pls provide me with the details as well for 2013/ 2014? My size is roughly about 100 – 120. Pls let me know the indicative pricing for the decorations etc…like what I see in the pics..thanks so much. Can you share the package options and the min/max no.of pax, and the set up cost? I like the decoration at marina keppel bay. Very beautiful and romantic. Can you email me on the details of such a setup. I have not decide the date for my wedding, but I’m looking at mid 2013. May I know what is the capacity and cost for having the outdoor wedding at Keppel Bay (outside Prive)? Hi, how many guest can Prive accomodate? Is there a in-hse caterer I have to choose or is it up to me? Can I get a quote for a 200 pax sit down dinner, for a Halal Cuisine Banquet? How much is this package? I am looking at around 150 pax. Due to my concerns with the humidity, are there any indoor venues that offer a great view of the outdoors? I intend to hold my solemnisation ceremony right before the luncheon. may i know the max capacity for chinese sit-down dinner? i would like to get more information on this venue! I would like to enquire for the solemnization package with dinner. Hi i would like to know about the wedding package of this beautiful venue! Please do let me know as much details possible! Hi I love this idea! My wedding is coming up on Oct 19 and I have been hunting around for the perfect outdoor venue for solemnization and wedding (without leaving a deep hole in my pocket) to no avail. Can you send me some ideas and proposals for 100 people, buffet, outdoors (garden, or by the water), absolutely romantic? Thank you! 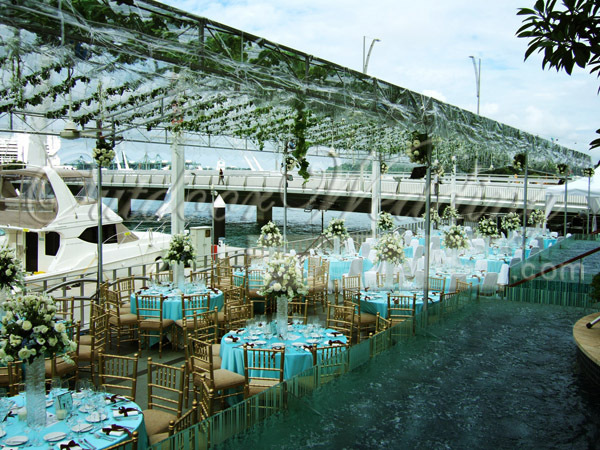 Could you send me the packages for 2014 wedding at Marina @ Keppel Bay? Hi. Could I also get a quotation for this package? Hi, I would like to get more information about a similar set up to this suitable for about 300 guests. We are thinking of a sit down dinner sometime in June/July 2014. Could we get some quotations please? Thanks!